For generations the poached egg has become a mystery. The rare few among us who can poach an egg without a wizzy plastic contraption are honoured heroes. 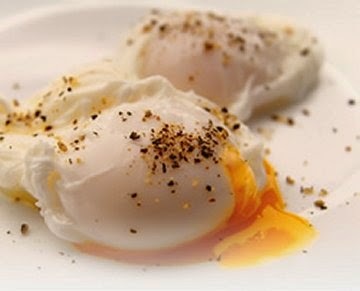 But no more - this simple recipe takes the mystery out of the egg. After a few practice tries you will be poaching like a pro. First off, don't waste your time with eggs that have been sat around for a week. The key to poaching perfection is in the freshness of the eggs. Fill the pan with freshly boiled water from the kettle. It doesn't need to be a huge pan-full, just enough to cover the egg. You can add vinegar, lemon, salt and all that jazz if you like, but according to Delia, all you need is water. Let the water just about boil so tiny bubbles starts to emerge. Keep the heat on low - you don't want the water getting exciting and moving about a lot, as this will disturb the eggs when you put them in. Now break in the eggs, one at a time, and very gently slip them into the water. Don't do this from a great hight - make sure the drop is as small as possible. Let them simmer for two minutes. When two minutes is up, remove from the heat and let them sit for 10 minutes. This will allow them to slowly cook without jumping and moving everywhere. Next, very carefully lift each egg out of the water on the draining spoon, letting it drain for a few seconds. Then place the spoon on the kitchen paper to absorb any water still left. Removing the egg from the paper can be tricky, but don't panic. You can always remove any stray bits of paper from the eggs once placed safely on the plate. Thank you for this receipt! For generations the poached egg has become a mystery. The rare best translation service for business few among us who can poach an egg without a wizzy plastic contraption are honoured heroes. But no more - this simple recipe takes the mystery out of the egg. After a few practice tries you will be poaching like a pro.